Sleep is always important especially for kids. Sleep isn't one size fits all, especially for children. Healthy sleep for a five year old looks much different than that of a five month old. 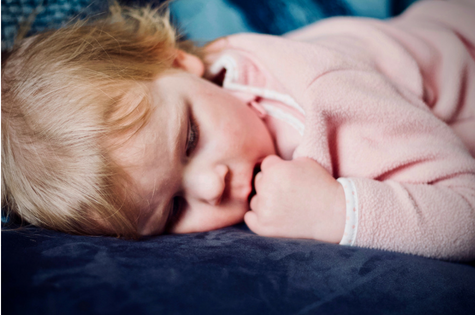 Children's' sleep needs will change as they grow, and their biological clock adjusts, too. Our biological clocks, also known as circadian rhythms, function on cues. Signals including noise, light, meals, and activity level tell our brains and bodies when it's daytime and when it's night, and therefore time to be awake or time to be asleep. When you're active during the day, exposed to sunlight or other bright light, hear the noises of the day, and get activity such as walking, eating, or talking to others, your brain understands that it's daytime and you should be alert. But when lights start to dim, your activity level lowers, and your routines slow down, your circadian rhythm gets the signal that it's nighttime and you should start winding down for sleep. Although following biological clocks comes naturally to adults, babies aren't born with a fully developed circadian rhythm. Although babies may sense some changes in time while in the womb, such as when mothers sleep at night, babies don't come out innately understanding that daytime is awake time and nighttime is for sleep. Circadian rhythms are learned, and in fact, most babies don't have mature biological clock until they're at least four months old. Newborns sleep night and day, truly sleeping on a 24 hour clock, unlike parents who sleep primarily at night. Young babies need 14 to 18 hours of sleep each day, but not all of that is at night. As they grow older, daytime naps become shorter, while nighttime sleep becomes longer. Eventually, around preschool age, most children stop napping altogether and sleep only at night on a regular basis. Although most children develop a healthy circadian rhythm just from following along with adult routines and maintaining regular bedtime sleep and nap times, there's always the possibility that children will struggle to maintain a healthy circadian rhythm. This can cause difficulty with sleep, keeping kids and parents up at night. Follow a regular sleep schedule and routine. Guide your kids' biological clock with a consistent sleep schedule and bedtime routine. Sleep should be predictable for children as you put them down for bed at the same time each night whether it's a school night, weekend, or even vacation. Take time to go through a relaxing bedtime routine so kids can start winding down before they actually crawl into bed. Expose children to light early in the day. Light is a powerful cue that can help children wake up more alert and reset their circadian rhythm. Open the curtains in their bedroom to let in morning light, turn on bright overhead lights, or simply go outside first thing to give kids light exposure in the morning. Limit light exposure at night. For the same reasons you want to support light exposure at night, you should turn down the lights at night. Limit or completely eliminate screen time at least one hour before bed. Use dimmers to make the rooms in your home a little darker at night, and use night lights or lamps instead of bright lighting whenever possible. Give kids a healthy sleep environment. Just as adults need a comfortable place to sleep, kids need a bedroom that's supportive of rest and relaxation. Make sure children are sleeping on an appropriate mattress, and keep their room quiet, dark, cool, and free of clutter so they can feel calm and ready to sleep when they get to their bedroom at night. Biological clocks are natural, but kids aren't born with a fully developed circadian rhythm. Parents should support good sleep habits to help children establish and maintain a healthy biological clock. Get a good night sleep with the right mattress!